If you own an an Amazon Echo, you can now listen to one audiobook for free. Because Amazon is giving away one free audiobook to Audible newbies who own an Echo. The hope being you’ll be so enamored with what’s on offer you’ll sign up for a membership. Audiobooks are becoming increasingly popular Getting Started with Audiobooks: How to Finally Finish Your "Reading List" Getting Started with Audiobooks: How to Finally Finish Your "Reading List" Audiobooks are a good way to tackle your reading list, but it can be difficult to get started with them. Let's make it simple. Read More these days. Probably because we’re all too busy to actually sit down and read a book, so we have to have them read to us while we’re doing other things instead. Still, this is all great news for Audible. 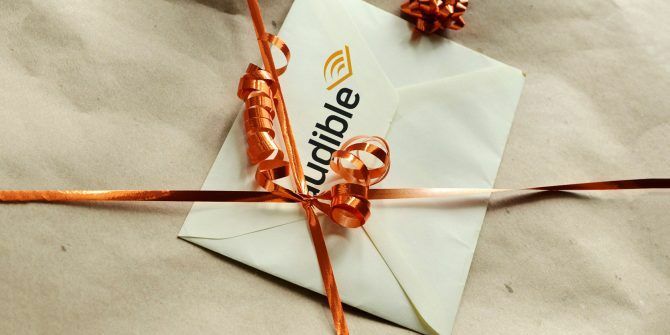 Audible is Amazon’s audiobooks division, with a paid-for monthly membership buying you one audiobook every month, plus more besides. If you’re not sure whether audiobooks are for you Audible offers a 30-day free trial. But now there’s an even better option. You can now listen to your first audiobook from Audible for free on your Amazon Echo. And all you have to do is say, “Alexa, read me _____” along with the author and title of the book you want to hear. You’ll then hear that audiobook in full. The only caveat is that you’ll have to be completely new to Audible to take advantage of this offer. Which means not having previously signed up for the free trial. But beyond that you’re free to choose any audiobook you want, even if it’s a new title. This offer to listen to a free audiobook through your Echo comes hot on the heels of Google starting to sell audiobooks on the Google Play Store. And as these are available at “an affordable price” and “without a subscription” Amazon is keen to fight back. Whatever the reason for this, it’s a generous offer. And with no obligation to then sign up for Audible you’d be a fool not to take advantage. Most of you probably listen to music through your Echo, so listening to an audiobook would make for a nice change. We have covered Audible extensively in the past, revealing the best audiobooks to listen to during your free trial and insider tips to help you get the most out of Audible. Oh, and not forgetting the excellent idea that is Audible for Dogs Audible Wants Your Dogs to Listen to Audiobooks Audible Wants Your Dogs to Listen to Audiobooks Audible has launched a new initiative called Audible for Dogs. This is exactly what you'd expect it to be: a place for your canine friends to listen to audiobooks. Read More . No, seriously. Explore more about: Alexa, Amazon Echo, Audible, Audiobooks. You don't need an Audible subscription to buy audiobooks. You can just buy them on Amazon as you would any other item, and many audiobooks are offered at a discount if you buy the equivalent Kindle book.